One might wonder why one of the major thoroughfares in Cheyenne is named Pershing Boulevard when Gen. Pershing never lived here. Although "Blackjack" Pershing was never a resident of Cheyenne, he was a frequent visitor. His first visit was in 1905 when he and his bride, the former Frances Warren, daughter of Wyoming Senator Francis E. Warren, stopped on their way to his assignment in the Philippines. Mrs. Pershing and their four children stayed at Fort D.A. Russell from 1913, 1914, and part of 19l5 while Pershing was on duty on the border and in Mexico. His wife and daughters are buried in Cheyenne. At the time of his marriage, Pershing was a captain in the U.S. Army. His father-in-law happened to be the chairman of the Senate Military Affairs Committee. Supposedly, Sen. Warren corresponded with his old ranching and hunting companion, President Theodore Roosevelt, and asked what could be done for his new son-in-law. Roosevelt is said to have responded, that the "President can only appoint to General." Warren responded, "That’s precisely what I had in mind!" Coincidentally, Pershing was promoted to general, over 862 senior officers, twenty months after his marriage to the Senator’s daughter. When asked about perceived favoritism to Senator Warren’s son-in-law, the President responded, "To promote a man because he married a senator’s daughter would be an infamy; to refuse him promotion for the same reason would be an equal infamy." Another title bestowed on Pershing was General of the Armies, which was invented specifically for him. George Washington was awarded the same honor posthumously. There are two theories regarding Pershing’s nickname, "Blackjack." One theory states that it arises from his ruthlessness in commanding the soldiers. The other theorizes that he gained the nickname because he advocated the use of the US Colored Troops in combat rather than relegating them to support operations in the rear. He was also concerned with their well-being. Whichever theory you believe, both say that the nickname was an accolade. 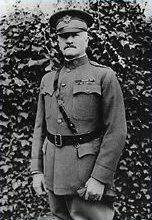 Although Pershing was very successful in his position as Commander-in-Chief of the victorious Allied Expeditionary Forces during World War I, all of his missions weren’t quite so outstanding. In 1917, Pershing led the Punitive Expedition into Mexico to capture Poncho Villa. He and his troops spent eleven months searching and never caught sight of the villain. This expedition, however, is notable because it was the last time American troops were sent into battle without helmets and gas masks. General Pershing’s military career was one of the most successful in American history. His personal life, however, was not nearly as blessed. In 1915, General Pershing returned to his command on the Mexican border, and his family moved to the Presidio in San Francisco. Disaster struck the family when Mrs. Pershing and her three daughters were suffocated in a fire at their quarters. Only their young son, Warren, survived the tragedy, rescued by a servant. On August 3, 1915, the Right Reverend Nathanial Thomas conducted the funeral services at St. Mark’s Church in Cheyenne. Internment was in the Warren lot in Lake View cemetery, and the funeral procession extended through town for more than half a mile. General Pershing, who never remarried, returned to Cheyenne in January 1920 for a visit. His first stop was a visit to the graves of his wife and daughters. Then a huge parade was staged in his honor. His memory is perpetuated by Pershing Boulevard, and after his last visit to Cheyenne, school children contributed money for trees to be planted along this avenue. Centennial Historical Committee, Cheyenne, The Magic City of the Plains (Cheyenne Centennial Committee: Cheyenne, Wyoming) 1967. Col. Gerald M. Adams, USAF (Ret. ), The Post Near Cheyenne (High Flyer Publications: Cheyenne, WY) 1996. History Channel documentary on Pershing and several Internet sites.